So I have a confession: I think I needed a little bit of a blogging break. Like I said in my last post, I've been very busy. It's the beginning of my senior year of college and I have been applying to jobs and getting some interviews. Looking for a job has really become a part-time job and is eating up a lot the time I usually spend blogging. I started to enjoy the break a bit, but now I want to start posting again. Last night, I decided to cook Matt and I some dinner. I had some rice and veggies and Matt said he had chicken so we combined all our ingreidents into this tasty dish. Now, it was absolutely delicious. I was a bit surprised. Matt only had some frozen chicken from Walmart which I was very skeptical about. This dish has a great harmony of flavors and worked out well. 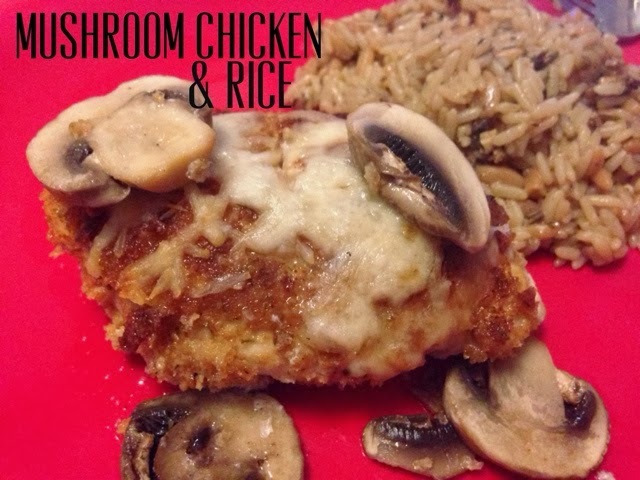 It's basically like a parmesan chicken, but with mushrooms. I used Near East Wild Mushroom Herb Rice Pilaf as a side and it worked out great. This dish goes well with a creamy chardonnay. 2. Place half of mushrooms in 9x13 baking dish. Combine beaten egg and milk in a bowl. Place breadcrumbs on a plate. 3. Melt 2 T of butter in a skillet over medium heat. Dip chicken breasts in egg/milk mixture and breadcrumbs on both sides. Afterwards, add chicken to warm skillet. 4. Brown both sides of chicken (3-4 minutes on each side). Place chicken in baking dish. Sprinkle chicken breasts with some shredded mozzarella. Add the rest of the mushrooms. 5. Pour chicken broth and wine into dish. Bake in oven for 30-35 minutes. Serve with rice. It's a delicious dish and makes great leftovers. Enjoy!